Learn to understand the structure of a random map and use it to your advantage to locate everything really fast. Before venturing out to scout your opponent, you must first find your resources, mainly food. The trick for this is quite simple: make circles around your Town Center. And with each circle, you go further away from your TC. This way you ensure to find all your resources relatively fast as they’re all located in a certain radius around your starting position. A standard set of (food) resources is 8 sheep (a group of 4 and two groups of 2), 2 boars and 3-4 deers. Many maps vary on this, but this is usually the minimum set. Yes, this title is not a typo, you can actually scout with your food. Or more specifically, scout with sheep. 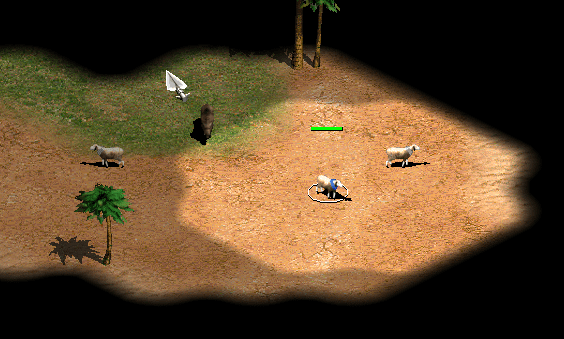 Sheep scouting has become an essential part of the game, especially on expert levels. The idea is that you use your sheep to scout and return them in time to your Town Center to be eaten. This way, even idle time for your sheep is reduced! With this technique, you can easily double your scouting efforts in the Dark Age. What’s even more interesting is using this technique on Nomad style maps, where you don’t start with a scout. Assign your scout to a hotkey (Ctrl+1) so you can easily find him back on the map. Use the idle military hotkey to check if your scout isn’t idling. You can use waypoints for your scouts, although this is just personal preference. Knowing where to find your opponent starts with understanding how a random map is generated. We’ll use Arabia as an example. You may have noticed that whenever you play Arabia, your TC is never pushed to the border of the map, nor is it anywhere near the center. That already reduces the possible places for a TC by roughly 50%. Next there is terrain to consider. Roughly 9 squares around your TC are always flat. So if you’re scouting 18 squares from the border of the map and you see nothing but hills, then you know you’re not close to his TC. Other things to keep an eye on are gold and stone mines. 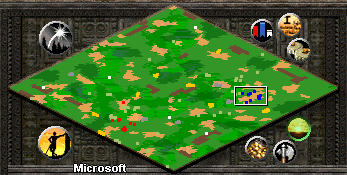 There are only 2 big gold mines on the map, and each are within a radius of maximum 16 squares from your TC. 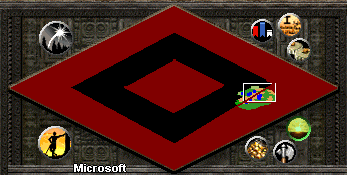 Relics on the other hand are never in TC range (at least 25 tiles). Another important guide is the placement of wolves. Wolves lure all across the map, but never too close to an enemy’s TC (40 tiles minimum). In short, if you happen to run into a flat area, not too close to the border and without wolves or relics, you most likely found your enemy. And that probably won’t take long. 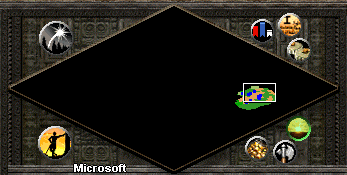 Let’s take the following map for example. Firstly, the enemy can’t obviously be behind you, and he can’t be inside your “personal space” either. So that excludes a first part of the map. If we take away the fog of war, you can see how this practically works. First we send the scout north, along the imaginary red border. We don’t spot any TC evidence and encounter very hilly terrain and wolves in the north. Then we send the scout west, same story, and additionally we find a relic on the hill, too close to the border to have a TC space next to it. 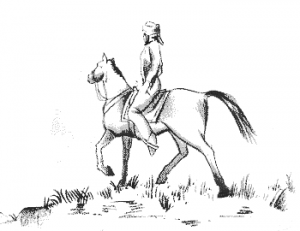 Then we send the scout south, and here we run into a small hill ridge which then rolls out into a flat land. A bit further we see a deer herd and a stone mine. 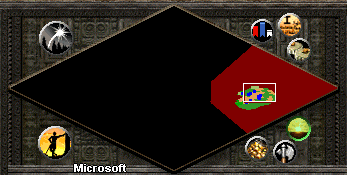 And at the end of this imaginary border, we find a boar! However, there’s only one way to really control this technique, and it’s practice. With some practice, you will be able to figure out where your enemy is, super fast. This is handy if you’ve been late in finding your resources and still need to find your enemy for an early rush. Knowing his layout of the map will also prevent you from blindly running your scout into his Town Center. It is very important to keep on scouting throughout the game. You might be pushing your enemy out of his city without knowing he is rebuilding elsewhere. Or maybe he has built a few stables up front, but he’s actually preparing an army of archers on the other end of the map, which will tear through the pikemen you prepared for the cavalry onslaught. Always keep on scouting. Knowing what the enemy is doing is what will give you time to respond to all his moves. And don’t only resort to scouts, a few outposts do wonders too! There’s a whole lot of interesting differences between these units, let’s take a look at them. Overall, Eagle Scouts are considered the better scouting unit, although they’re quite similar. Also note that new eagles can’t be trained until the Castle Age, whereas new scouts can be trained in the Feudal Age. A special note about the attack though: scout units have automatic attack upgrades when advancing to the next age. This makes scouting wars quite peculiar with scouts vs eagles. In short: Eagles win in the dark age, Scouts in the feudal age and Eagles take over the torch in the castle age again.